The Marshall University Data Center measures (1800) square feet in area and is equipped with a raised floor system and two (2) CRAC’s with a total capacity of 56 tons. The data center supports six (5) rows of equipment cabinets of moderate equipment density. The facility is located in an interior room centrally located close to center of the 4th floor. The room is equipped with three (3) door sets located throughout the room. The doors are well-sealed to prevent air infiltration. Windows are present along the external walls of the data center. The 4th floor area was built on a raised floor with the sole purpose of expansion of the Data Center’s overall footprint. 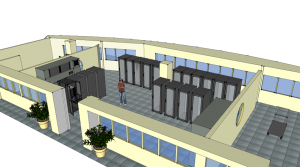 It is estimated that the Data Center occupies only 25% of the raised floor area. The raised floor system consists of a Tate Manufacturing, Inc. tile system of 2’X2’ tiles set in a steel rail matrix. The floor is built over a concrete slab located on the 4th floor. The slab appears to be in good condition, sealed with no cracking observed. The plenum has some dust, metal shavings and other debris. The floor is equipped with 26 perforated tiles (see detail below) and supports 25 equipment cabinets as well as associated HVAC and power distribution equipment. Beneath the floor standard support stanchions are located at each grid-work intersection. The raised floor depth is 0’ 10” (0.10’) measured from the slab to bottom of the raised floor. Cable tray is installed under the floor tiles. The sub-floor area is restricted by the following: i. Raised floor support piers with an effective frontal area of 36 sq. in. (+/-) per pier. The two CRAC’s are not equipped with diverters. No leaks were observed during the inspection of facility. All raised floor/wall interfaces were tight and well sealed. The raised floor is configured with twenty-six perforated floor tiles as depicted below. All tiles were of standard 25% open fully perforated type.